This short article tells us why it is important to shut down your computer properly. power button for a few seconds cuts power immediately to the whole computer. 1. Causing harm to your hard disk. A computer hard disk is rotating thousands of times a minute. The little arm that reads and writes data to the hard disk is moving backward and forward all the time. Each of these things can cause hard disk data corruption. A couple of people have asked if there is any alternative to pressing and holding the power button when a computer is hanging and unresponsive. you can probably safely assume that something has gone badly wrong and the computer has frozen up. In a healthy computer, these occasions should be few and far between. But in this situation there is no alternative to pressing and holding the power button to turn off the computer. Restarting the computer may be of a little help because you may be prompted to allow the check disk tool to run. 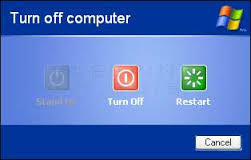 Let it run to check for, and try to repair, any issues that mind be found on the hard disk as a result of the power off. And if possible check for any error messages or helpful information in the event viewer that would explain the freeze-up. Although finding something useful in there could be rare. I wrote this short article to encourage you to take a few seconds to shut down windows properly, as it could save your money in the long run for computer repairs.